If you missed Part o: Preparation and/or Part 1: On our way you can still join in and read more by clicking on the episode you would like to read. Otherwise feel free to continue to read. Durje, our guide waved us in and we where on our way. I swopped backpack with Pasang because it was smaller but it was so uncomfortable and only a few minutes in I thought that this would never work. We reached the first checkpoint which is just outside of the dusty road of Syrabrubesi and the first nerve wrecking moment came. Robin did not have his TIMS pass still and we did not know if we would be allowed to continue from here. But Durje asked me and Leonardo to keep walking and he would sort the problem out with Robin and the checkpoint officer. After a few more nerve wrecking moments we got green light and we could finally go on our adventure. There is a small hanging bridge, typical Nepali standard, that divides the village of Syabrubesi from the mountains and the trail. As we closed up on it it struck us for real that we are trekking in the Himalayas. What an amazing feeling. We walked through the old part of the village which is on the other side of the bridge, walked along locals, chickens, herded goats and every type of animal that could possibly be amongst people. The river in the distance told us that the djungle is not far from us now. As we approached the djungle we walked through a huge field of Hemp. The locals call it Ganja. Durje has told us that the first day would be the hardest day, the big test, to see if we could make it all the way. And it sure was. It was uphill from the start and we needed breaks often. The trail is rocky and covered with huge stone blocks that functions as ancient stairs. Covered with moss and grass. As we walked uphill we had to be cautious to where we put our feet. Branches and loose stone where all over the place and the muscles in our legs where tired from walking a few hours uphill. It can be dangerous if you are unfocused, you can easily injure your ankle or leg. Leonardo and Robin walked first after the guide. I was the slowest one and my knee was hurting so me and Pasang walked last. I felt like going home already. Leonardo and Robin kept a good mood but even if I kept telling myself that the hardest day is today, it will get better, I was still struggling. We took a small break and as Sherpas and other trekkers met us on the already narrow trail, Robin tried to be polite and moved a step backwards towards the edge. And he lost his balance. The grass grows from the side and up so it looks like the path is wider than it is. He lost his balance and we all feared that he would fall down the steep hill. It was a long way down. Luckily one of the passing guides and Leonardo reacted quick and grabbed him and prevented a serious injury. A bit shocked but still smiling we kept the pace and kept walking. But the danger was not over yet. At last we came to a big waterfall and our lunch stop. After a pep talk and some Dal Baht and the mandatory picture taking and selfies we continued. The forest here is amazing. Almost like a Scandinavian forest but with huge stone blocks and ancient trees covered it a smooth layer of moss in different greens. Trees covered in orange moss lined the trail as we walked further. We couldn’t stop looking around us, if only the trail would be smoother we wouldn’t have to focus on our feet as much. But the trail had become flatter and we all sighed gratefully having climbed upwards and our muscles already acing for a few hours. We made a few stops on the way, there are a few guesthouses and traditional tea shops along the way where you can stop for lunch or a few minutes rest. Felt like we needed more stops than most people. Probably the slowest group in Himalaya. But who cares. We walked, walked, walked, climbed and walked some more. Passed lush forests and big waterfalls. This day was indeed the hardest one. Almost no flat terrain, only uphill. And we were all tired. In a few hours the sun would set and we had been walking since eight this morning. We had past a landslide and seen Max deer when we reached the last piece of the already challenging day. After a half hour climbing we arrived at the small lodge we called home for the night. It is a small stone built house for the family and the dining room with a cast iron stove to keep us hot. Outside was another house with small bedrooms with double beds for us. We got the last room so we had to share the double bed amongst the three of us. But the sun had already set and it was cold. So we honestly didn’t mind. We ate and warmed up from the trekking in the main cabin. I went to take our clothes down from the line outside to bring in to the warm dining room. Equipped with a headlamp I started to take them down. When I pulled one of the trekking pants the stone underneath me budged. In front of me was a steep fall down to the river. And I fell. Hard. About 2,5 meters, rolled around and landed with head and neck on a large log. I paniced. I could feel the poison ivy I landed in sting me all over my body because I wore just light clothes. My head hurt a lot I didn’t dare to move. And then I got angry. Angry at myself from falling when we already almost had an accident the very same day. And then I thought to myself that my neck might be broken. Or something else in my body. That I wouldn’t be able to trekk in the Himalayas anymore. Luckily both Leonardo and Robin were outside with me and saw me fall and called for help. Durje and Pasang both bravely jumped over the cliff and carried me up to the main house where a group of Czeck ladies examined me for injuries. They were veterinarians. So I guess they knew more than most of us about a thing or two when it comes to injuries. Turns out I gotten away with a light concussion, a few bruises and some big scratch marks on my arms, legs and feet. My pants were torn and I had no feeling in my right foot and hand. The ladies suggested we cancelled the rest of the trekking. So we had a big decision to make tomorrow. Go back and rest and cancel the Himalaya adventure. Or continue. Find out next time on episode 3 of our Himalayan adventure and don’t forget to follow us on Facebook for the lastest pics and updates. 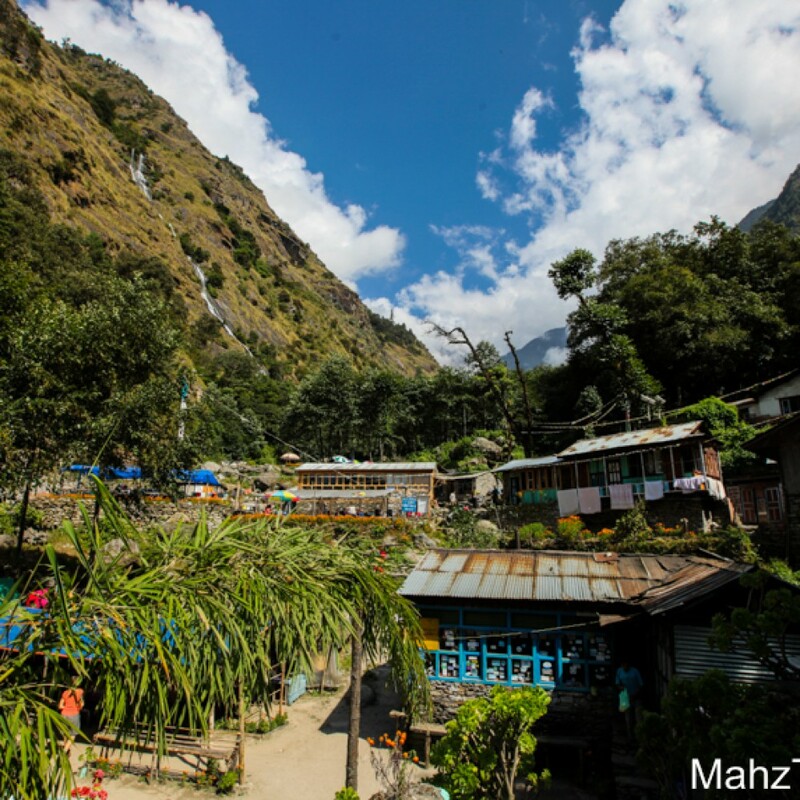 Himalaya trekking in Nepal 1/9 – Getting there!